Intro from Jay Allison: John Biewen is a thoughtful teacher and the editor of "Reality Radio: Telling True Stories in Sound." 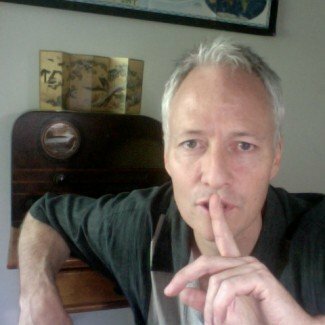 His Transom piece meditates on the eloquent use of silence, pause and breath on the air. He includes lots of audio examples. This fits well with Transom's championing of Slow Radio. Come sit quietly for a moment, and read and listen. Given that sound is our medium, it’s not surprising that when we talk about the craft of radio, we talk about, well, sound: how to structure it and layer it, when and how to use different types of the stuff. We rarely talk about one of our most potent options as audio producers: the withholding of sound. Silence. Or, if not total silence, a noticeable pause in speech and other sound “events,” leaving just the already-established ambience of the scene for a few seconds or more. A lot of us avoid quiet in our day-to-day lives. No one to talk to at the moment? Time to click on the radio or whip out those earbuds! And we may bring that fear of silence (as though of the grave) to our radio making. I’m guilty, too. When listening back to my own work, what makes me wince as often as anything is the lack of space. So, note to self as well as to the rest of you: Go quiet more often. The inclusion of the occasional pause—just a couple of seconds here and there—can make a big difference in the power and the emotional oomph of our work. It seems to me that the various uses of silence (and near silence) in radio storytelling fall into two main categories: the dramatic pause, and the transition. Joseph does preserve the laconic, sometimes halting feel of Weston’s speech. He lets him breathe. He just shortens Weston’s longer pauses, and cuts out some false starts and repetitions, to maintain momentum and save the listener from getting antsy. It’s standard radio editing, all to the good. Janet’s 4-second pause before “and you know it” does not really create the drama. Her words and her impassioned delivery are plenty vivid before that and the cut would be almost as strong if it ended with, “then you ain’t gonna have nothin’.” To me, the pause and the last phrase are a bonus. I can’t imagine scripting such a pause. For that very reason, it amplifies the sense of listening in on real life. Another pause I like to employ is more subtle, and it comes not inside an actuality, as in the above examples, but between one cut and another, or between a cut and a narration track. Of course, it’s customary in public broadcasting, as distinct from the bang-bang pace of most commercial radio and TV, to leave a short beat between an actuality and whatever comes next. Here’s a conventional transition, from a piece I produced with Tennessee Watson a few years ago—the narrated version of “Nuevo South” (which we also produced as an un-narrated half-hour doc). The piece tells the story of a small North Carolina town, Siler City, and its response to a dramatic wave of Latino immigration. A couple of minutes in, a man makes a general statement in a tease cut, and I then introduce him. The pacing of the transition from the speaker to me is pretty typical for a public radio news feature. From the end of Cuadros’s last word to the beginning of my first, there’s about .4 seconds of silence. Just a minute later, though, another character is introduced. Eddie Ambrose Greene, a former truck driver and lifetime resident of the town, is sitting in a car outside a chicken processing plant, watching Latino workers go in and out through the gates. He makes a hair-raising analogy. The gap between Eddie and the narrator: 1.5 seconds. One measly extra second, but that’s almost quadruple the standard tape-to-narrator transition, above. It’s a one-second pause that allows the listener to digest what’s just been said, but I also think of this kind of pause as a sort of silent raised eyebrow, a glance in the direction of the listener that says, “You got that, right?” Some producers draw attention to quirky or inflammatory comments by fading in a few seconds of music just afterwards—an approach perfected and popularized, of course, by This American Life. A couple of extra beats of silence can serve as a more subtle strategy, one you can use even in a news-ish piece where music wouldn’t be appropriate. Silence—genuine silence in the form of a fade-to-black as opposed to a pause within a quote—can fill another role often played by music: the transition from one scene to another, from one chapter of your story to the next. This technique seems to show up most often, and most effectively, in pieces with no conventional narrator, though there’s no reason it couldn’t be used just as well in a narrated piece. In My So-Called Lungs, one of Joe Richman’s legendary Radio Diaries pieces, Laura Rothenberg is sitting on her hospital bed describing her life with cystic fibrosis. This excerpt has nice internal pauses and silences, including a lovely moment when Laura points out the quiet for the listener. But what I’m highlighting here is the end of the scene, marked by the click of her recorder being turned off, followed by the transition to the next scene. Elegant, yes? It may seem odd to say it (see: “sound is our medium,” above), but these moments of no-sound, when a piece “touches black,” are among my favorite radio passages these days. People often talk about the intimacy of great radio like this, an intimacy that stops you in your tracks and causes you to lean in, literally or figuratively, to catch each word, each breath, each sound. That intimacy is heightened tremendously by silences, whether or not our minds make conscious note of them. My last example combines a couple of the strategies I’ve outlined here: a) the pause that highlights what’s just been said and b) the transition from one scene to another. It’s also without doubt the longest mid-piece fade-to-black that I, at least, have ever employed. This needs a bit of setup. The excerpt is from the fifth hour of the five-hour series, Five Farms, which I produced with executive producer Wesley Horner and a team of field producers. The theme of the fifth hour was Succession, the future prospects for each of the family farms we followed in the series. This section is on Eddie Wise, a 60-something hog producer in North Carolina and one of the nation’s few remaining African American farmers. During the series we’ve heard how Eddie, the son of sharecroppers, struggled for years against a bigoted loan officer just to buy his farm. We’ve listened as he fed his hogs, bred them (“It’s showtime!”), and hauled them to slaughter. We’ve heard him banter with his wife Dorothy as the two talked about their marriage and their love of farm life. Now, as part of the last episode on the Wises, we’ve followed Eddie and Dorothy to a black farmers’ “land loss” conference in Raleigh. The transition from Carl Bond’s last word, “gone,” to the first stroke of Eddie Wise’s rake takes a full seven seconds. (It’s 11 seconds until Eddie’s first word.) Only about one second of that stretch is actual silence, but this is an unusually roomy transition in which no real sonic event takes place—just the fading of a steady, droning, ambient sound into silence. A more typical, news-featurish fadeout of the conference hubbub would take a couple of seconds or less. By drawing it out I hoped to highlight the magnitude of Bond’s words and, perhaps, to spark a visual image for the listener: America’s black farmers, fading away, soon to be gone. I’m no minimalist. That much-used public radio adjective, “sound rich,” applies to many of my pieces and those that I love. I’m all for scenes layered with action and voices, music (sometimes), and energetic pacing. Nor am I arguing for a hands-off approach to audio production. Any crafted radio piece is, after all, a highly edited representation of a small slice of reality. At minimum, the producer decides where to point the microphone and which bits to keep and leave aside. As you probably noticed, some of the pauses and silences I’ve highlighted here are manufactured; they don’t all come from leaving things alone. To paraphrase the British feature-maker Alan Hall: No sound—or silence—is innocent. I’m merely pointing out that while our medium is sound, it is also time. The question we face as producers is not only what comes next, but also when? The world is sometimes quiet. In real life, people pause. Those things should happen from time to time on the radio, too. John Biewen is the audio program director at the Center for Documentary Studies at Duke University, and has been making radio since 1983. He reported for Minnesota Public Radio, did a stint covering the Rocky Mountain West for NPR, and produced many long-form documentaries for American RadioWorks. He still produces for national and international audiences in addition to teaching radio-making at CDS. With co-editor Alexa Dilworth, he edited the book of essays, Reality Radio: Telling True Stories in Sound, published in 2010. Love it, Jody. I’ve always thought that rule was kind of funny in a non-monarchy — the president, and only the president, may not be (internally) edited. I gather the rationale has to do preserving the president’s exact words and phrasing for the historical record or something like that. Anyway, if it helps listeners get used to hearing a few more pauses, it’s all good. Lovely and encouraging piece, John. Silence is golden. As a print journalist it’s good to be reminded of that. As someone trained to work with people in crisis, I learned early on that silence can be sacred — and deeply therapeutic. Thank you for conveying this lesson through the thoughtful use of sound. Excellent stuff. I often forget to employ “fade to black” as a chapter-changer. Many thanks for the time and effort to provide these examples. It’s such a knee-jerk reaction to keep it moving. Long live the pause! One of the most unusual job interviews I ever had was on the phone with Bill Siemering. I vaguely recall what we talked about, but what really sticks with me were his LONG pauses..the most unsettling and unusual silences. And that’s when I first ‘got’ Bill: he was working at his own considered pace, weighing and thinking. Woe to those who rush him. He wanted me to seriously consider what we were sharing. The silences did that. Nice to be reminded of the seductive power of silence! I got interested in making radio, eons ago, partly because of a book we read at school by a German author, Heinrich Boll, called Dr Murkes Gesammeltes Schweigen, which translates as Dr Murke’s Collected Silences. The protagonist, Dr Murke, a young radio editor, spends his time splicing together the out-takes – the pauses – on the cutting room floor, and listens back to this reel of ‘silence’ in the evening (set in 1945, with quarter inch tape) . What he means by this subversive action is not explained, but it tickled my fancy! The book itself is a scathing commentary on religion in post-war Germany, and Boll won the Nobel Prize for Literature. So, a weird way no doubt to get attuned to sound, but Boll and his silences got me hooked! Thanks John – great piece. John, it’s interesting that Bill’s silences are what you remember about that interview, more than what was said. It speaks to how unaccustomed most of us are to real pauses, and how effectively they can get our attention. Siobhan, somebody in the U.S., I forget who, recently made a short audio piece that consisted mainly of breaths and ums and grunts. (Remind us, someone, who did that?) John Cage, of course, took the idea to its logical conclusion — or maybe, come to think of it, his was a somewhat different idea — with his composition, 4’33”. Making a piece that’s all negative space will certainly make the point about the wonder and glory of negative space, but, call me old fashioned, I tend to think that negative space gets its power in proximity to the positive stuff — in this case, sound. (I understand you weren’t suggesting otherwise by citing the Boll novel.) Thanks for sharing! I got to this post about pauses and silence right at the end of a very busy week which included your intense and enlightening audio institute at CDS. The post was just a great cap for that week of listening. I’m so glad I came across it as I re-approach the piece I was working on during the institute. Thanks so much. Yeah, Jeremy. Your project, being so introspective in nature, really lends itself to pauses and spaces. You can help us to hear someone think. And Jim (another serial CDSer, sorry to blow your cover): A sculptor of silence. Love that. Reminds me of the sculptor of sculptures, Giacometti, who had an epiphany and got obsessed with the space AROUND things as opposed to the things themselves. Thus all those skinny walking people, etc. Fun to think about the possible implications for radio. But yes, we radio types could definitely learn a thing or two from great preachers. The first pieces I did for NPR were about Native Americans; Alaskans, specifically, whose first language was not English. There were long silences, silences full of meaning and music. And my editor at NPR made me cut them all out. I argued for cultural integrity; she argued for cultural (linguistic) imperialism, and she won. A few years later, with a different editor, I learned to fight for those informative pauses. Thanks for reminding us, John, how important they are. The main reason that most of us tend to edit things tightly is, of course, airtime — or the ever-present limitations on it. The dang show has only given me x minutes (whether 2 or 59) and by god I’m going to use every precious second to work in a bit more of this marvelous tape and information I’ve gathered. It’s a tendency usually shared by reporters and editors (though not in your case with the Alaska Natives), and it’s understandable. But, as you say, pauses are informative, too. And they’re often more compelling than that last line of copy or tape that we’ve wedged in. Then again, yes, the editor needs to be on board. Because the danger is that you leave in a nice pause and the show says, well, I guess if you’ve got time for that pause we can lop it out and shorten the piece still further!